There are an unlimited number of things you can buy for your dog. Some are terribly dangerous. Some are poorly made. Many are unhealthy. Some are loads of fun even if they are more for you than for the dog. There are, however, not a whole lot of things you actually need for a dog. Here is a list of things you should have when you get the dog home. What else you need will become evident as you need it. Absolute Must #1: Enzyme cleaner that will completely remove pet odors. (It is easy to remove the odor so people can’t smell it, another issue entirely to remove it so that the pets don’t smell it and use the same spot over again.) No matter how well housebroken your dog is or you think your new dog is, you need to have some of this on hand just in case. Absolute Must #2: Chew toys. Some dogs don’t chew a whole lot and some will eat whole pieces of furniture. You need to have at least a couple of good durable chew toys to start with. Depending on the size of the dogs I recommend durable nylabones (for little dogs) and kongs which come in every size. When your new dog picks up anything in his mouth that he should not have, take it away and give him a chew toy (and say “trade”). If he picks up an old shoe never think “well that shoe is old” because he will pick up every shoe if one is allowed and he doesn’t know from Louboutins. All he knows is what it smells like (and he loves that smell). Collar (not a prong or a choker, just a flat collar that his leash will clip to and his ID tags will hang from. Halter for small dogs or dogs who pull on leash. Food – For the first few days you should feed the dog whatever food he is used to eating. Some dogs will get sick if food is changed abruptly and this is more likely during the stress of rehoming. Beware that many shelters feed dogs lower quality food (because that’s all they can afford or it’s donated to them). Find a premium food that will be good for your dog as soon as you can and gradually switch him to it. Crate: Crates are good for use while the dog is getting used to his new house but we hate to see dogs spending too much time in crates. For some dogs the crate is a safe haven and they go lie in the crate to chill. Other dogs hate the crate and will injure themselves trying to get out. If you don’t want the dog to sleep in bed with you a crate is a good place for him to sleep. Make sure it is big enough for him to stand up and turn around in. For more info on crate training see this page of our main web site. Car seat or restraint. There are a wide variety of dog restraints. See our article entitled Traveling in Cars and Trucks with Dogs. Dog Steps are a very good idea for tiny dogs. Stairs to the bed and couch will really save a lot of wear and tear on little joints and in your dog’s later years you’ll be glad you got them. Beware though that some steps are pretty expensive and not all dogs can be induced to use them. Petsmart has some dog steps for $19.99 These are good to try and see if your dog will use them. These are the basics that a dog will need from day one. You will probably add to his toy collection as you find out what he likes to play with. Other necessities include health items such as flea preventive and heartworm preventive. Heartworm preventive is a must especially in warmer climates. Flea preventive should be on hand even if it isn’t needed yet. See Kill Fleas Cheaper. 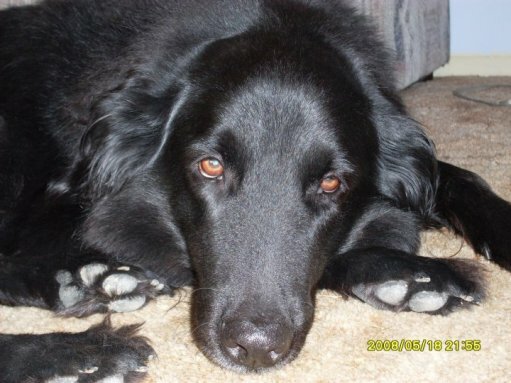 Lisa R. Fekete says: Dodger Isiah–Half Labrador & half Collie…He is very sweet and gentle! This entry was posted on Wednesday, March 31st, 2010 at 8:00 am	and is filed under Adopting an Adult Dog. You can follow any responses to this entry through the RSS 2.0 feed. You can leave a response, or trackback from your own site.